A new method of creating an image of the lungs is being tested by staff at a hospital in Oxford and experts say success could lead to better treatment for conditions such as asthma. The new imaging technique involves patients inhaling a "hyperpolarised" xenon gas before they get scanned. The more typical MRI scan makes the lungs appear black because the air within each lung does not emit a magnetic signal. 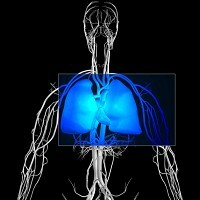 Inhaling the gas before the scan means an adapted MRI machine can create an image of the lungs. The hospital trial is backed by the biomedical research centre in Oxford, run by the National Institute for Health Research. Any improvement in asthma treatment could in the long-term encourage people with such conditions to venture off on holiday, but they should arrange asthma travel insurance before departing. Dr Tahreema Matin, who is involved in the trial at Churchill Hospital, said: "For different diseases, xenon imaging would have different roles. For diseases like chronic obstructive pulmonary disease and asthma, part of its role would be to identify those with mild forms of the disease and show exactly where within the lung the disease is. That would then inform the treatment. One of the limits of radiotherapy in treating lung cancer is that it destroys healthy tissue."